Believe it or not, my fascination with sediment started at about 10 months old. My first ever word was “dirt” (though my mother hotly refutes my father’s recollection of this milestone as she’s certain my first word was “mama”). Despite this early indication of my future passion, my interest in mud somewhat waned in late childhood and all but vanished in high school, as my science classes focused on human anatomy, physics, and chemistry. Who can guess what career path I would be following today had I not been placed, thanks to a testing error, in advanced calculus during my first semester of college? Quickly realizing I was in way over my head, I switched to the only available course that would fit my schedule – introductory geology. My interest in the natural world was quickly rekindled, this time from a more scientific viewpoint. Thanks to my professors and research projects, I discovered my passion for studying coupled human-environment systems, climate change, landscape geochemistry and, of course, mud. Fast forward to today, and I’m a graduate student studying coastal sediment dynamics within Oregon’s estuaries. 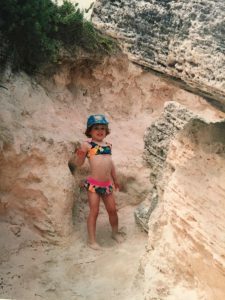 3-year-old Erin investigating sedimentary beds in an outcrop in Bermuda. I outline my somewhat serendipitous path into the earth sciences for the following reason: though the natural world fascinated me from an early age, had I not had the dumb luck to switch into a geology course in college, I would not be studying sediment biogeochemistry today. 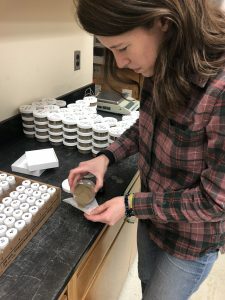 When I applied to Oregon Sea Grant’s Malouf Scholarship, I did so with the goal of providing kids with exposure to earth science research starting at a young age. Though most children possess a curiosity about the nature they find in their backyards, K-12 students don’t often take their first science course until high school , and many schools choose to focus on physical and life sciences. A 2012-2013 study by the American Geosciences Institute found that only one state required high school students to take a year-long earth and environmental science course for graduation, and only six states required that Earth & Space Science topics be covered for graduation . This is despite the fact that the National Science Standards has placed equal importance on Earth and Space Sciences. Many scientific organizations have also called for equal inclusion of earth science education in K-12 science curricula, including the Geological Society of America, which released a position statement on this topic . Recently, environmental education has received more attention through the introduction of the Next Generation Science Standards (NGSS), which strives to teach physical, life, and earth & space sciences using inquiry-based course design. So why is environmental education gaining momentum in K-12 education? Research conducted by eeWorks (a partnership between the North American Association for Environmental Education and Stanford University) found that environmental education improved students’ knowledge in other important fields (including science, math, reading, and writing); emotional and social skills; and academic skills (critical and analytical thinking, and communication). Moreover, it increased students’ desire to learn, environmentally conscious behavior, and interest in civic engagement . 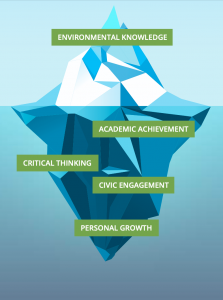 Improved knowledge of the earth and natural processes is just the tip of the iceberg for K-12 students who participate in environmental education. Students also showed improvement in other areas . Since beginning my year as a Malouf Scholar I’ve learned a lot about K-12 earth science education. One thing I’ve learned is that there are many others in the state of Oregon who are invested in environmental education beginning in formative years and continuing on through high school. Oregon was one of 26 states nationwide that adopted the NGSS in 2014. Though updates to the Oregon Science Standards has been incremental, the state’s NGSS incorporate disciplinary core ideas related to Earth and Space Sciences that explore environmental science topics related to human activity. The NGSS earth science concepts are now introduced during earlier ages and continue throughout K-12 education. Moreover, NGSS increase student interest in learning by focusing on crosscutting concepts that connect different areas of STEM . Throughout the next few months I’ll learn even more about enhancing environmental education as I finish planning, execute, and reflect on a series of educational events for K-12 students in Oregon. In my next post, I’ll describe the events … Stay tuned! Hi Erin, Thanks for your post! I had recently been reading a bit about the Next Generation Science Standards, and really like how relevant you made it to think about in terms of helping to shape the way kids understand the world. Do you think that your trajectory would have changed if you had nurtured your love of dirt through high school? Either way, it sounds like the experience has helped you to think about the role of earth sciences in K-12 education! Im excited to read further about the events you are planning!